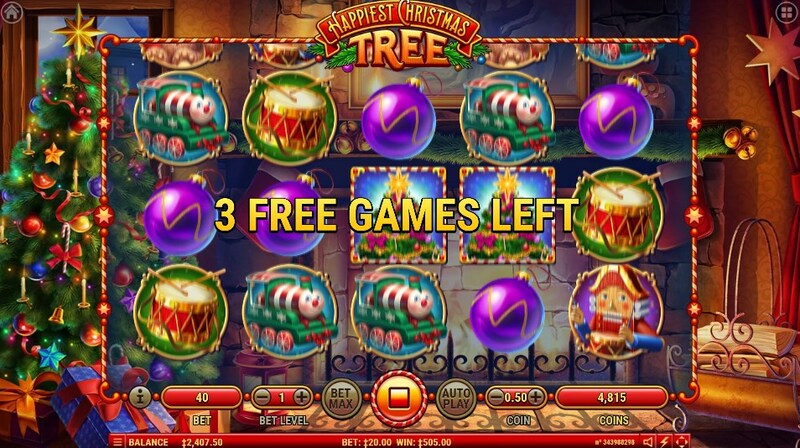 Feel the spirit of Christmas and experience the atmosphere of the holiday playing for free in the slot Happiest Christmas Tree from the company Habanero. Technically, the Happiest Christmas Tree slot has 5 spinning reels and 40 pay lines. In the game you are waiting for wild symbols, free spins, as well as four fixed jackpots, one of which can bring a win in the amount of x250 from your original bet. The design of the gaming machine fully conveys the holiday atmosphere. Game drums are located on a snowy street between the houses, which are decorated with luminous garlands. Among the symbols you will see: a drum, a nutcracker, a bear, a train, as well as four jackpot symbols in the form of Christmas tree decorations – a star, a moon, a ball and a bell. The symbol of the Christmas tree has unique capabilities, can be used as wild and scatter. Free spins function – activated in a standard way, for this you need to get at least three scatter symbols in the form of a Christmas tree. 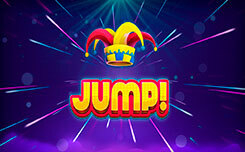 You will have the right to participate in 15 free spins, during which the jackpot symbol that took part in the winning combination is removed from the playing field, and you will be able to get the rotation, only with expensive symbols. 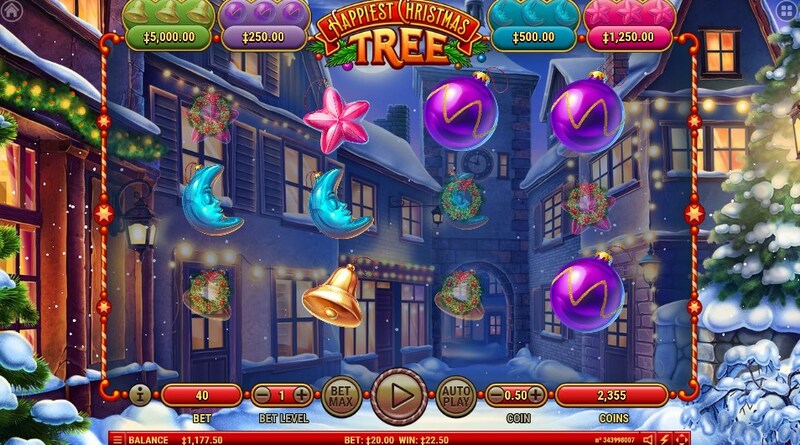 On the top of the game screen, there is a field with four fixed jackpots and Christmas toys. By collecting the full collection you activate the main jackpot mode. After that, a screen with 12 Christmas wreaths will appear in front of you. You need to choose the wreaths one by one in order to see which symbol is hidden there, as soon as you collect three identical symbols, it will be determined which of the four jackpots you will receive. Fourth and most profitable jackpot in the amount of h250 – you will get if you manage to collect three symbols of the bell. 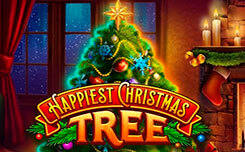 Playing for free the Happiest Christmas Tree slot machine on our website, you will not only enjoy the atmosphere of the upcoming holiday, but also be able to win one of the fixed jackpots.